" A Song On RAMCOSA REUNION-19 By S. P. Balasubrahmanyam"
తరలి రారా రాంకోసా బంగారు పండుగకు. Dr Stalin Ch (1960) is a relentless fighter against caste and superstitions. Dr Varahalu (1960) practiced all his life in a village and is a most popular practitioner. Dr D Kameswari (1961) distinguished herself as a practitioner with values among all strata of the society. Dr Krishnarao KKV (1971) set up the first cooperative Diagnostic lab in Kakinada with high standards and a harbinger of many that followed. Dr K V Krishna Kumari (1962) is a noted writer and a passionate Rangarayan. Her memoirs on RMC are very touching. Dr Pydah Janaki (1969) is a melodious singer. Her song is a must in all Ramcosa meets. Dr Diwakar (1969) is a talented writer and actor. His many college magazines are real pieces of art. Dr Somasekhar (1971) is a versatile stage actor. Students of this college distinguished themselves in all spheres of life and professions and all corners of the globe bringing laurels to their alma mater. Dr Sivaji (1972, who passed away recently) is an avid Rangarayan and a fatherly figure in Ramcosa. Dr SSC Chakra Rao (1968) is a dynamic leader. He was past President of Indian Society of Anaesthesiologists - National, and pioneered the Indian Resuscitative guidelines. Dr A V Krishnam Raju (1966) former Principal of RMC, and former Vice Chancellor of Dr NTR University of Health Sciences. He is an active old student and a bridge between the NRIs and RMC. Dr Kamineni Srinivas (1965) is a passionate Rangarayan and a pillar of strength to Ramcosa. Dr Nimmagadda Upendranadh (1961) is a founder director of NRI Medical College, Mangalagiri and a prominent donor to Ramcosa house. Dr Bhaskara rao Bollineni (1974) is the founder of KIMS Super specialty hospital, Hyderabad and owner of KIMS Medical college, and GEMS Medical college Vijayanagaram. 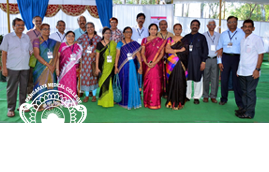 Dr Bhaskara rao Ganni (1974) is the Managing Director of GSL Medical college, President of All India private Medical colleges association, and the Organizing Chairman of Ramcosa Reunion 2019.